They work in different metals markets, but there's an even bigger difference to focus on. It's hard to compare an aluminum producer like Alcoa Inc. (NYSE:AA) to a precious metals company like Wheaton Precious Metals (NYSE:WPM) as the commodities they sell are inherently different. However, that doesn't mean the comparison doesn't turn up an interesting and important difference in their business models. If you are trying to determine if Alcoa or Wheaton Precious Metals is the better buy, focus in on costs. Alcoa is one of the largest pure-play aluminum producers in the world, with operations across the aluminum value chain, including bauxite, alumina, and aluminum. The aluminum business includes aluminum sheet and cast products, as well, both of which add at least a little value to the aluminum it produces. The commodity downturn that started in 2011 was tough on all commodity producers, but it was particularly hard for Alcoa's aluminum business. That's partly because Alcoa has been around for over 100 years -- it pretty much invented the aluminum industry -- and over time its operations had become, to simplify the issue, a little old and inefficient. Alcoa has worked hard to fix that problem. For example, it has closed or sold more than a dozen smelting and refining assets over the past decade. Over that span it also curtailed capacity at around a half dozen other facilities. The end result has been pretty impressive: Between 2010 and 2016 Alcoa moved from the 30th percentile of the alumina cost curve to the 17th. In aluminum it went from the 51st percentile to the 38th. So Alcoa has clearly been moving in the right direction with respect to cost. But this brings up the biggest difference between Alcoa and Wheaton: Alcoa is actually doing all the work of mining and producing aluminum. Like any business, its costs will go up and down over time. If Alcoa wants to change its cost structure, it has to do a lot of heavy lifting. Because of this burden, investors might prefer Wheaton Precious Metals' business model. Wheaton is what is known as a precious metals streaming company. Essentially, it provides cash up front to gold and silver miners in exchange for the right to buy silver and gold at reduced prices in the future. This arrangement is good for miners because it provides them with access to capital when other sources, like banks and capital markets, may not be financially desirable. How streaming works, according to Wheaton. Image source: Wheaton Precious Metals. For its part, Wheaton likes these deals because, in return for its cash, it gets contractually locked-in low prices. Wheaton's average price for gold is around $400 an ounce, while its silver costs are around $4 an ounce. Those costs are way below current spot prices for gold and silver. The best part, however, is that Wheaton doesn't have to do anything after signing a streaming deal. A mine's costs, even if they rise over time, have no bearing on Wheaton's negotiated price for the gold and silver being produced. Alcoa, by comparison, is running an aluminum business and has to worry a great deal about its cost structure, something clearly highlighted by its cost-cutting efforts during the downturn. 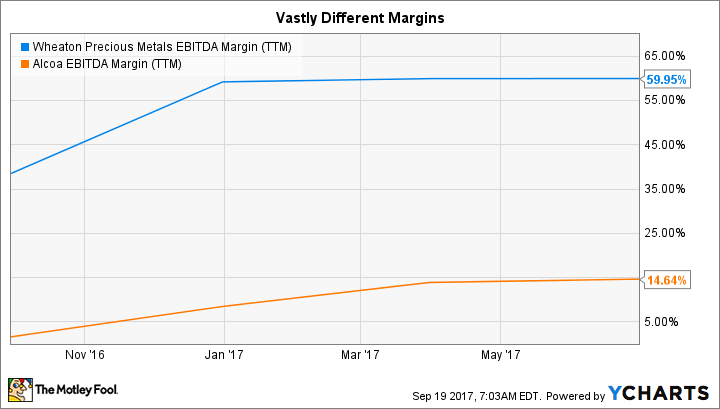 WPM EBITDA Margin (TTM) data by YCharts. To see the difference here, it's helpful to compare the EBITDA margins of Alcoa and Wheaton. As the graph above shows, Wheaton's margin is far wider. That's a direct result of the streaming company's locked-in low costs and, just as important, the fact that it doesn't actually do any mining. Wheaton's streaming model doesn't change the fact that its top and bottom lines will fluctuate along with the prices of precious metals. But shifting aluminum prices will have a similar impact on Alcoa's revenue and earnings. The big advantage for Wheaton is that its business is immune to changing mining costs such as expanding wages, equipment needing to be replaced or upgraded, and other basic expenses (e.g., the volatile price of fuel to operate equipment). Wheaton's costs are locked in, and that gives it an edge over miners of all sorts, including Alcoa.